Want to give your face a natural sun-kissed glow? Try Cowgirl Dirt’s all-natural Dusty Bronzer™. 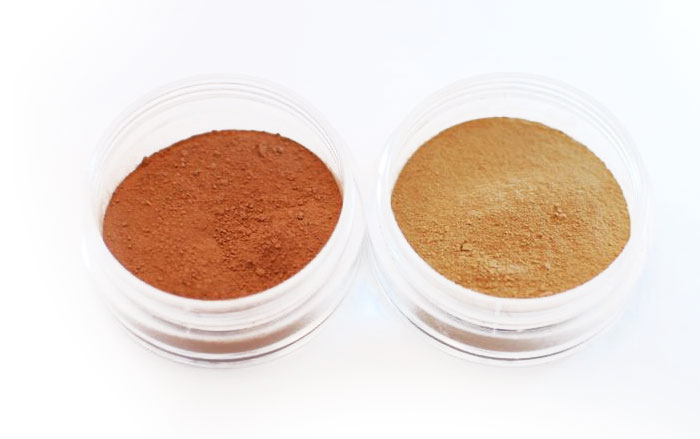 Made with all natural mineral powder, this bronzer is sure to give your face the extra addition of contouring it needs. With a slight shimmer added, not only will Dusty Bronzer™ add to your contouring routine, it will also give you a natural glowing look no matter what the time of year. Sample Size good for 1-3 uses. I got trail and I absolutely loved it it was a beautiful bronzer with a little shimmer in it. I got my mom hooked too! I sampled both colors and I found that the Trail color was much nicer for my olive, medium skin tone. A little goes a long way, so it gives just the right amount of "sun" color to your skin. I am looking forward to ordering the full size. I ordered the arena bronzer. Lovely color and great addition to the makeup arsenal! A little goes a long way with excellent pigmentation. Great color, perfect for everyday to gently accent the face with a light glow of extra color. This bronzer is great! I use Trail, and it's a good color (not orange), it lasts, and isn't made from chemicals. The colors a lot darker then I thought and a little goes a long way! I originally bought a sample of Trail, but it was much too bold for my skin tone. I then bought the Arena bronzer and it is a perfect shade. Great for contouring and adding a natural sun kissed look. Beautiful color! I love the light sparkle in it. Looks great and wears very well. The color I choose was arena, my mother said I had a very pretty glow in my face, thank you. Not only is Cowgirl Dirt Dusty Bronzer™ perfect for contouring your face while giving it a natural glow, it’s nourishing minerals also provide your face with added benefits. The key to bronzer application is to make your face look as natural as possible. To achieve this, apply the bronzer in the places the sun is most likely to hit first on your face. Start with the Cowgirl Dirt Kabuki Brush and a small amount of Dusty Bronzer™ in the lid of the bronzer container. The Kabuki brush’s wide bristles will help to make sure there is no streaking and the application isn’t uneven. Tap off any excess powder into the lid. Apply the bronzer in a sweeping manner across the forehead at the hairline, under the cheekbones, and along the jawline to add dimension to the lines of your face and neck. For more contouring definition, try adding a small amount across the collarbone and shoulders, and along the sides of the neck. If you are looking for just a light brushing of bronzer, use the Fan Brush. The wide bristles gently sweep over facial features to give you a light bronzed look. If you find that the bronzer is a tad too dark or too shimmery, there are ways to adjust it. Start by taking the Kabuki Brush (for a denser coverage), the Large Foundation Brush (for a lighter brushed coverage), or the Fan Brush (for a light, wispy coverage) and dipping it in your shade of Mineral Powder Foundation and tapping off the excess. Next, take the same brush and dip it lightly into a small amount of the Dusty Bronzer™ in the lid of the bronzer container. Apply it in a sweeping motion to the desired areas. This will tone down your bronzer and give you a more natural look. If this dilutes it too much, you can apply the bronzer normally and then put a small amount of Mineral Powder Foundation on top to tone down the enhanced look of the bronzer. 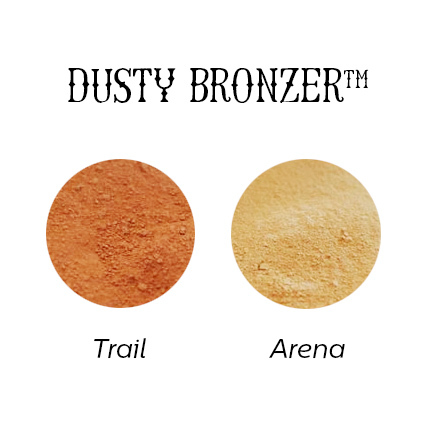 Cowgirl Dirt Dusty Bronzer™ comes in two shades: Arena and Trail. Arena's cool rich tones give definition to skin tones that lean toward the lighter cooler spectrum. Trail's warm dark base tones are perfect for darker complexions. Both Arena and Trail compliment the lines of the face and provide flawless contouring and a sun-kissed look.